The range of the Egyptian Vulture is Southern Europe, Africa east through Arabia to India and southwestern Asia. 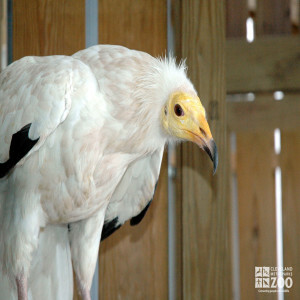 The Egyptian vulture inhabits mountainous rocky regions, hills, lowlands and deserts. The Egyptian vulture, with habits similar to other vultures, is of considerable value as a scavenger. It is smaller than many other vultures and at a carcass must yield to its larger cousins. Their numbers have been much reduced lately. The Egyptian vulture nest on cliffs, where available, otherwise on date palms or other suitable trees. The nest is an untidy heap of sticks, rags or any other material. They generally lay two eggs. Both sexes rear the young. The young vultures fly after 90 days or so, but do not seem to mature until 5 or 6 years old. When getting ready to nest, these vultures sometimes use old nests of other species in trees.